Welcome to the Geology of Leornian Home Page. 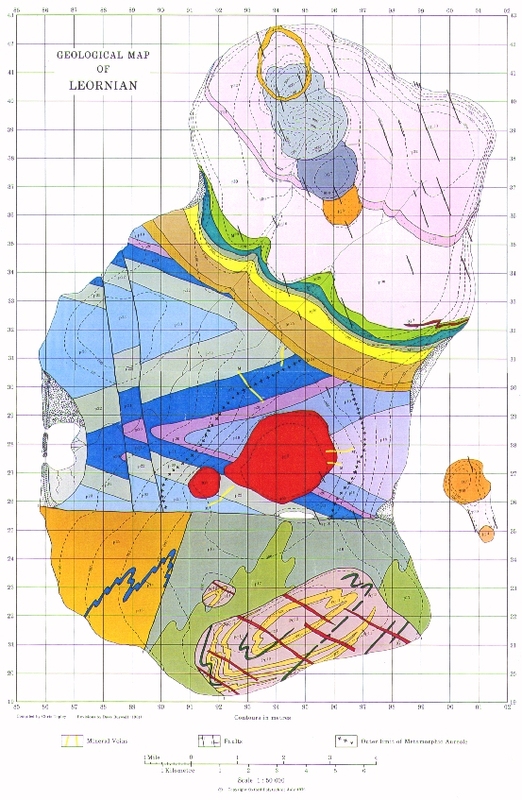 This is a geological map of the mythical island of Leornian. It was originally compiled in the 1970s, using traditional drawing and printing techniques, to provide links between the elements of a practical course in introductory geology at Oxford Polytechnic (later Oxford Brookes University). It continued to perform this role, linking together practicals in mineralogy, igneous and metamorphic geology, sedimentology, stratigraphy and palaeontology, and providing an introduction to realistic geological maps to students starting their geological careers, until 2003. From 2008, Leornian lives again as one of the main elements in a first year module in Geological Maps and Structures at the University of Derby. Click on the map, or on the list of 'virtual posters' below, to visit the outcrops and geological features of the island. The map and the island provide a theme linking all the practical parts of the course. This web site is designed to be used in and outside the laboratory classes, where you will study and interpret the rocks, minerals and fossils from different parts of Leornian. Original map compiled by Chris Topley (1976). Revisions by Dave Burwell (1981). A later revision of the map (not shown here) was produced by Clark Friend.